Management in organizations is not work done by an individual, but a collaboration of many individuals and groups. Effective communication, therefore, is a critical factor of success. Management results depend on how well information is formulated, transmitted, received, and processed. Consequently, the language used by system elements must be clear to all other elements which stay in contact with them. Having effective and clear communication and communication protocols go beyond the human domain. Standard and unambiguous communication is extremely important for automation systems as well. If systems speak different languages their integration will require special adapters-translators, which both complicates and significantly increases the cost of integration. However, if systems speak the same language, they are capable of interacting directly without any additional mediators. We call this kind of integration “gapless.” As gapless integration is more fluid and simple, we are convinced that all integration will move towards it. Because of standard and unambiguous communication, in time the need for expensive middleware will disappear, and automation systems will be able to be created by putting together standard components as simple as one might put together lego blocks. The design of universal communication protocols, however, is not an easy task. On one hand, a protocol must be specific enough to transmit information with its unique structure. On the other hand, it has to be sufficiently generic enough to cover a wide spectrum of automation systems and the problems they solve. Finding a balance is quite difficult. In our research of management automation we found that, although their automation aspects can be quite different, information flows used by management systems can be broken down into a few standard types. To explain, in any management system there is an exchange of situation information, goals/tasks, execution results, escalations, and interpretations of different facts. All those flows use different terms and data structures. For example, in a company that produces software, developers and testers may talk about components, devices, functions, and defects. Project managers could use terms such as “project,” “task,” “resource,” and “delay.” Then, at top management levels, you may hear words like “clients,” “contracts,” “competitors,” “trends,” “strategies,” and “innovations.” In management automation, groups and management levels that use a common vocabulary are usually called stratas. From this example of strata you can see that the common terms used to describe management information can be split into the few standard types: goals (“task,” “project,” “contract,” “strategy”), interpretations of facts (“defect,” “delay,” “trend”), structure and state of the system and environment (“device,” “resource,” “product,” “client,” “competitor”), and so on. Using these standard types of information flows, universal communication protocols can be developed. Standard and unambiguous communication will greatly aid in all areas. Communication between decision makers must have a clear structure with unambiguously understandable content. Communication must be standardized. Standards allow an organization to avoid additional translators and mediators and enable gapless integration between components. Universal standardized communication protocols in a management automation system can be tailored to the terms of specific management strata that use a specialized vocabulary. Goal (action) - a desired state that the management system plans to achieve. Interpretation (observation) - a fact containing information that is useful for management decision making. Result - an interpretation related to reaching a concrete goal or goals. A result typically carries information about the execution progress in direct (percentage of completion) or indirect (values of primary parameters) forms. However, it can sometimes contain general facts on how a goal is being reached, or on which factors positively or negatively impact the goal-reaching progress. Support information - additional information, typically with data about the system and environmental structure. In automated as well as manual management, communication must be standardized. Management information flows can be broken down into standard types: goals, escalations, interpretations, and support information. Terms, used in information flows, can be tailored to specific management strata via a specialized vocabulary. The more universal a communication protocol is, the higher the number of management systems that are able to use it and the less effort it takes to integrate. On the other hand, over-generalization leads to fuzzy structures in transmitted information. It requires a well thought-out approach and balance. 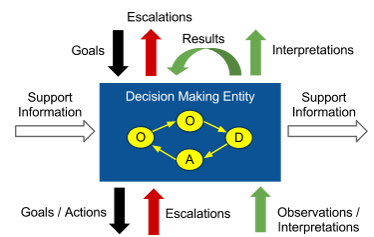 The classification of information flows by type and context references allows us, at least, to direct information to the correct place and then find someone or something able to interpret and process it. That is the minimum that we must try to achieve. A good example of standard and unambiguous communication in mixed human-machine systems is Battle Management Language (BML). It is used in Battlefield Command & Control to transmit orders that are formulated following the 5W principle (Who, What, When, Where, and Why). This language has an informal representation as well as a formal notation in XML, or as graphical symbols on military maps. NATO officers and soldiers are trained to use BML and, because of this, a US officer can take command over a group of Turkish soldiers and effectively complete orders in a short amount of time. Cultural and language differences won’t make a critical impact there--all information and orders are unambiguously formulated and understood by everyone. Additionally, BML has been implemented in battle simulators and robots. Before issuing an order, a commander can run it through a simulation and, if the results are satisfactory, then issue it to troops or battle robots. In both cases the order will be executed uniformly, as it is expected to be. The standard and unambiguous method of BML communication makes this possible.